Forever Heifer from Ruth K. Burke on Vimeo. Forever Heifer is a multimedia sculpture that situates sensory experience and corporeal comportment as a mutual source of interspecies communication. The wooden sculpture is multiform and architecturally and symbolically references a run-in shed (which are typically situated facing the north east), a milking stanchion, and a trough. The sculpture is completed by the presence of a body: a motion sensor triggers a two minute screendance. 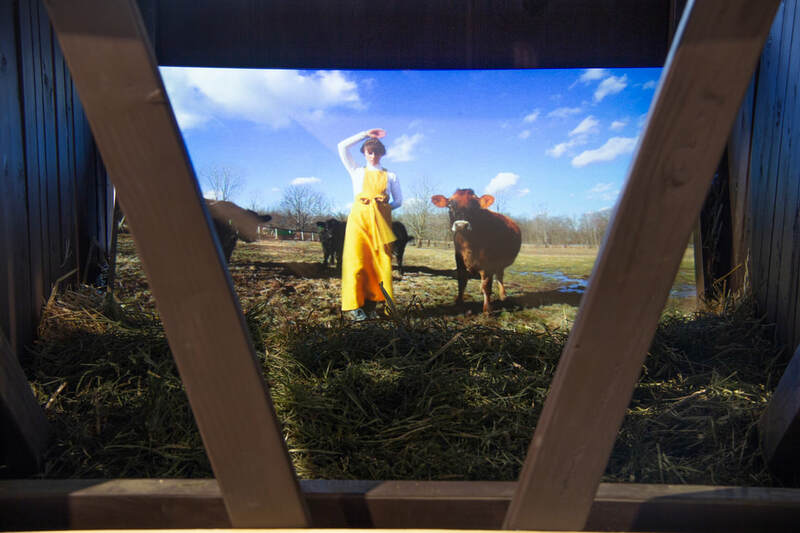 Inside, a blend of timothy and alfalfa hay stimulates the olfactory senses and transports a viewer out of the gallery and into the territory of the cow. The two minute video explores interspecies improvisation and call-and-response. The performer wears a costume reminiscent of a milkmaid; the osage orange color references the dichromatic visions of cows. Ruby, the Jersey heifer, willingly engaged with the performer without any incentive outside of satisfying her curiosity.